Leicester City. Champions of England. The ultimate underdog. Announced on the world stage under the leadership of Claudio Ranieri. Everyone in the modern footballing era will tell you about ‘little’ Leicester City, who took on the big boys in 2016 and won. Entering the Champions League, Leicester City reached the quarter-finals. No small feat. But I’m going to take you back to the first time ‘little Leicester’ stunned football. Back 20+ years ago. The Walkers Stadium was just a dream. Jamie Vardy was just nine years old. Filbert Street. The millennials among you may not recall Filbert Street, but under Martin O’Neill, the Foxes had some magical times at the stadium. A small, maximum all-seated capacity of 21,500. Under the floodlights, the magic happened. None more so than through the wizardry of cult hero Mustafa Kemal Izzet, or the more familiarly-known Muzzy Izzet. Izzet spent three years with Chelsea during his schoolboy days and it was from here that O’Neill plucked a prize asset in March 1996, initially on a three-month loan, which was extended to include the play-offs. Leicester were going strong in the then-titled Division One and with Izzet a welcome addition, promotion via the play-offs was sealed. A permanent contract at Filbert Street followed for a fee of £800,000. Emile Heskey, Steve Claridge, and Neil Lennon graced a side brimming with talent, but Izzet brought something else to the table. He wasn’t the most prolific goalscorer from midfield. But he built a strong partnership with Lennon and despite a slow start for the Foxes – just one win in the opening six games – they eventually adjusted to Premier League life. Having shown glimpses of his talents in the opening weeks of the season, Izzet’s love affair at Leicester kicked into life on November 16, 1996, in a 3-1 away win at Aston Villa. City led 2-1 at the break. 85 minutes were on the clock when Izzet latched onto a through ball from Claridge. Collecting 25 yards from goal, the tasty Turk nutmegged Carl Tiler to break into the box and coolly slotted around Villa keeper Michael Oakes to seal the points. It was a beautiful goal. And it was just the beginning. Through the season just two more goals followed, including a 25-yard strike that confirmed a 2-0 win at home to Middlesbrough, but he was a vital cog in the side. Leicester finished the season in ninth place. They exceeded everyone’s expectations with gritty, hard-fought victories, but it was their League Cup antics that got the terraces talking. A feisty player, who was not afraid to get stuck in, Izzet got the League Cup road to Wembley rolling as he netted against Scarborough in the first of a two-legged second round clash. Wins followed against York City, Ipswich Town and Manchester United as the Foxes reached the semi-finals. O’Neill’s side were up for the cup but a Vinny Jones-led Wimbledon awaited. The sides contested two very physical matches but alongside Lennon in midfield, and a defensive duo of Steve Walsh and Simon Grayson, Leicester were more than a match for their southern rivals. An away goals triumph and a trip to Wembley awaited. Izzet didn’t play his best game at Wembley as the underdogs took on a Middlesbrough side including superstars Juninho, Emerson and Fabrizio Ravanelli. Emile Heskey nabbed a 119th-minute equaliser to cancel out Ravanelli’s earlier extra-time strike, setting up a replay at Hillsborough. Leicester were more relaxed. Another tight affair saw the game go the distance, and midway through extra-time Steve Claridge was on hand to fire the Foxes to victory after Steve Walsh headed on a Parker free-kick. Jubilation for Izzet and Co, and European football sealed with passage into the UEFA Cup. If the 1996/97 season was to announce Izzet on England’s greatest football stage, 1997/98 was the year he prospered. Going from strength to strength the Turkish star was now a fixture in O’Neill’s starting XI. Endearing himself to the home fans, Izzet was a physical player who had a touch of grace with the ball at his feet. He showed what he was capable with a monstrous half-volley as Leicester drew against Blackburn Rovers early in the season. Just four goals were to come for the season but Izzet’s silky footwork against Crystal Palace saw him nominated for the December goal of the month as he danced inside the left back, glanced up at the goal, and struck a sweet lob from the outside of his boot to the top corner. A derby-day goal against your main rivals. Well, there’s no harm in that. A flying header in a 4-0 home win against Derby County gave the locals the bragging rights for another season, even if they were to finish the season two points behind the Rams. The European adventure came to nothing as a first-round matchup with Atletico Madrid resulted in a 4-1 aggregate loss. Izzet. Oh, Izzet! Oh What!?! 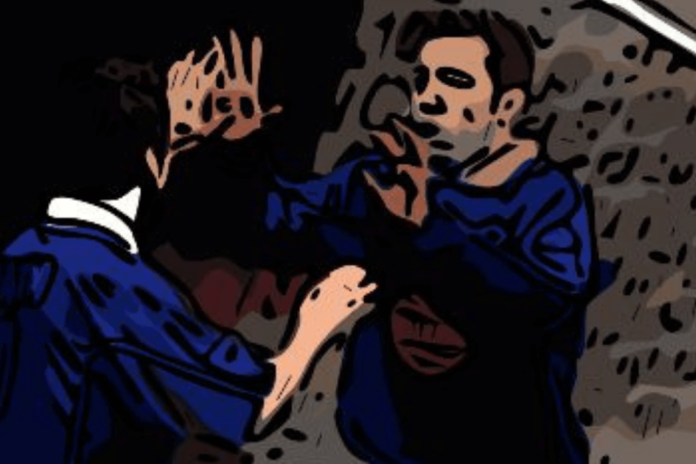 Thunderous strikes were becoming second nature to the Izzet as Leicester entered the 1998/99 season and it didn’t take long before he was at it again. You can’t teach a wily Fox new tricks. Izzet had the commentators speechless as City defeated Tottenham 2-1 at Filbert Street. A poor Les Ferdinand clearance – striker’s clearance – saw the ball loop to the edge of the box. Izzet had his eyes on the prize and struck the sweetest volley beyond Espen Baardsen, sending the fans wild. He proceeded to run 50 yards down the pitch to celebrate with the bench in some of the most iconic scenes of the O’Neill era. Just a month later he was at it again. Different competition. Different opponent. Same outcome. The type of goal you practice against the barn door as a 10-year-old growing up in Northern Ireland. League Cup fourth round. Leeds United. Filbert Street. City trailed 1-0 with just two minutes to go when Nigel Martyn ran to the edge of his box to head clear, with Steve Walsh in close proximity. What followed was pure brilliance. Izzet, seeing the Leeds stopper well off his line, sent a volley all of 30 yards, over Martyn’s head and into the back of the net. Cup run salvaged. Two minutes later Izzet was upended in the box and Garry Parker slotted home for a last-gasp victory. Pandemonium in the stands. The cup heroics continued all the way to Wembley, but Leicester couldn’t match their heroics from two years ago. They returned to the Midlands as runners-up to Tottenham Hotspur, Allan Neilson shattering the dream with an injury-time winner. The Foxes completed the season in 10th place and their status as a mid-table top-flight club was secured. O’Neill’s side had continued to perform beyond their means and the big clubs came-a-knocking. Highly-rated goalkeeper Kasey Keller and midfielder Scott Taylor left on free transfers before Emile Heskey was sold to Liverpool for £11m in March 2000. Tim Flowers replaced Keller in a £1.1m deal and Stan Collymore joined on a free from Aston Villa midway through the season. A big season lay in wait. Both for City and for Izzet. Not only would they go on to win the League Cup for the second time in four years, but they achieved their highest league finish for 24 years in placing eighth. For Izzet, it was double figures. 10 goals for the season. Third-highest scorer for the club behind Tony Cottee (13) and Matt Elliott (11). Early season goals against Coventry City, Chelsea and Watford had Filbert fans buoyant as City sat pretty in fifth. A great midfield partnership with Steve Guppy and Robbie Savage allowed Izzet to prosper. Through September and October he went on to bag five goals in four games – an absolutely divine overhead kick to boot – as Liverpool, Aston Villa, Spurs (2) and Grimsby were among his latest victims. The fine form continued until Christmas but as the build-up to a third League Cup final in four years beckoned, the Foxes lost five of their next seven games, slipping to 11th in the league. Elliott’s double secured victory at Wembley for Izzet and Co as they defeated Tranmere Rovers 2-1 in the League Cup final but it was to be the end of a stunning era for the club as Martin O’Neill accepted a job with Celtic and moved north of the border. Izzet got itchy feet as West Ham and Middlesbrough sought the midfield maestro, but he was enjoying his football at Leicester and decided to stay loyal to the club which had given him so much. Peter Taylor took the reins from O’Neill for the 2000/01 season and Izzet was one of his main protagonists. The heady heights of eighth and ninth were hard to maintain as Leicester finished the season in 13th. However, Izzet blossomed. Top scorer in all competitions for City, he was up to his old tricks in netting against Derby, while overseeing victories against Chelsea (twice), West Ham and Liverpool. A first European goal came against Red Star Belgrade as Leicester bowed out in the first round. An international debut with Turkey arose, Izzet qualifying through his Turkish father, despite being born in Mile End, London. Four appearances in the red of Turkey beckoned. Sterling performances throughout the 2000/01 and 2001/02 Premier League campaigns landed him a call-up for the 2002 World Cup in South Korea. Playing just once, in the semi-final loss against Brazil, Izzet took home a World Cup medal when Turkey defeated South Korea 3-2 in the third-place play-off. The good old days at Leicester were coming to an end as the club were relegated at the end of the 2001/02 season. A new home awaited City in the second tier as the Walkers Stadium opened for the 2002/03 campaign. The Filbert Street days were over. Izzet wanted away – to join O’Neill in Scotland. The move never came and although Middlesbrough returned for the prized asset, £6m-rated Izzet stayed at City, the club refusing to sell for a reduced price. He contributed five goals as Leicester made a swift return to the Premier League but the yo-yo effect saw the club relegated for a second time in three years as the 2003/04 season came to an end. Izzet’s City career closed as he moved on to Birmingham on a free transfer but history was written. 248 Premier League appearances. 34 goals. 27 assists. Two League Cup wins and a World Cup bronze medal. Not bad for a young loanee from Chelsea.